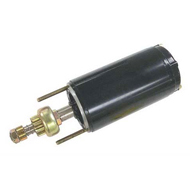 One of the key components in any boat is the marine engine starter motor. While these are similar to starters used in cars and trucks, the parts are not interchangeable. Boat starters are different from automotive starters because they are protected from moisture and contaminants as well as shield your boat from stray sparks. Gases can collect in the bilge and, should there be a stray spark, cause a hazardous explosion. Be aware that all marine electrical parts must pass regulations that confirm they are ignition-protected before they are sold to consumers. You can always buy with confidence from Wholesale Marine. 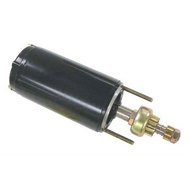 We carry a huge selection of quality, regulation-compliant boat starters from leading manufacturers such as Mercury, Volvo Penta, as well as reliable OMC parts. Check batteries: corroded or dead batteries present the biggest issues and have scuttled many a day of recreational boating. Check connectors: make sure all are clean and that battery cable terminals are tightened and have a gap between the terminal and clamp. Check wiring: Feel the lines for soft spots which indicate corrosion signalling their replacement, and be sure to tag wires when you replace them so you’ll do the job right the first time and prevent an electrical hazard. Check High Resistance: make sure there is no drop in voltage which will not only shorten battery life, but also ruin expensive electrical components. Our customers know to turn to Wholesale Marine for the best quality boat parts at competitive prices. If you are not certain what part you’ll need, use our convenient engine parts finder, or just give us a call for courteous and efficient service. We’re boat enthusiasts too, and will help you make the right boat starter selection. Be sure to ask about our Captain’s Club Rewards program for additional discounts on everything you need to keep your boat primed for its next voyage! Call us at (877) 388-2628; we’re here Monday through Friday, from 9:00 AM until 6:00 PM, EST.